Protesters chant Nazi phrases, wield torches near Confederate statue in Charlottesville, Va.
Several dozen torch-wielding protesters gathered Saturday in Charlottesville, Va., chanting Nazi rhetoric as well as "Russia is our friend." Mayor Mike Signer has issued a statement likening the event to a KKK demonstration. The group congregated in Lee Park by a statue of Confederate Gen. Robert E. Lee, which is slated to be removed from the premises later this year following a February city council vote. Earlier in the day, protesters had also gathered at nearby Jackson Park, voicing their commitment to protecting what they called their "white heritage." Chants of "blood and soil" broke out just after 9 PM. The German-originated expression, popularized in the Nazi era, refers to an ideology of "ethnic purity" based on blood descent and territory. After about ten minutes of activity, Charlottesville police intervened, and the crowd extinguished their torches and dispersed. Law enforcement had also broken up the Jackson Park protest hours earlier with relative ease, although intervention there followed rowdier arguments and scuffles. 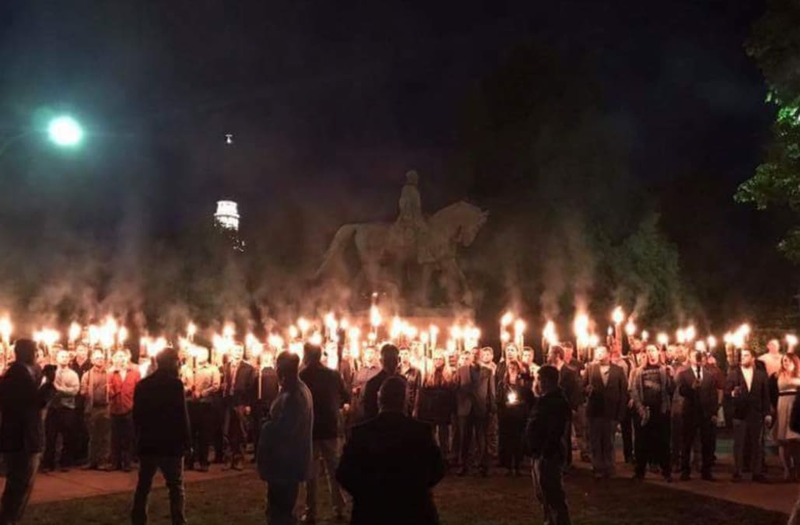 "This event involving torches at night in Lee Park was either profoundly ignorant or was designed to instill fear in our minority populations in a way that hearkens back to the days of the KKK," Charlottesville Mayor Mike Signer said in a statement. At Jackson Park, some demonstrators spoke to press. "We're not white supremacists," said protestor Orry Von Dize. "We are simply just white people that love our heritage, our culture, our European identity." They're chanting "Russia is our friend" and the Nazi Era phrase "Blood and Soil." Following the event, supporters tweeted photos showing the scene with messages like "You will not replace us" and "#SaveJacksonAndLee." In attendance was infamous white supremacist Richard Spencer, who shared a photo of himself holding a torch. On Sunday, he mocked a reporter who called out the event: "Glad you enjoyed it," he tweeted. Spencer, a Nazi sympathizer who claims he created the "alt-right" movement, made headlines in January 2017 when he was punched in the face on live TV. A group suing Charlottesville over the Lee statue removal says it had no involvement in the Saturday events. "It has come to our attention that several out-of-town groups associated with white supremacy and (identitarian) beliefs conducted events and protests in both Lee and Jackson Parks today," a rep wrote on Facebook. "Neither Save the Robert E. Lee Statue nor The Monument Fund were in any way involved in these events and only learned of them though media reports."